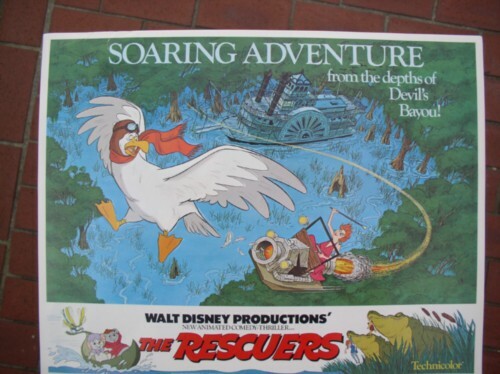 Disney Villain The Rescuers card dated 1977 WDP Lobby Card. Orville, an albatross played by Jim Jordan, ride to Soaring Adventure from the depths of Devil's Bayou. .. The Rescuers the Walt Disney Animated Classics series, the film is about the Rescue Aid Society, an international mouse organization headquartered in New York and shadowing the United Nations, dedicated to helping abduction victims around the world at large. Size: 11 inches high x 14 inches wide. This lobby card has a crease in the top left of the lobby card when you frame this you will not really see the crease. Other wise it in excellent condition. This is marked. It says Technicolor ®. Released by Buena Vista Distribution Co. Inc. © copyright 1977 Walt Disney Productions.. Lobby cards are similar in texture and size as a lithograph but a Lobby card was what Disney used to promote movies and only given to the theaters to use for promotions and were never sold to the public. This is a piece of history of Disney Promotions.